Showcasing the diversity of handicrafts, handlooms and cultural fabric of India, the 33rd Surajkund International Crafts Mela, 2019 gets underway from February 1-17 at Surajkund Mela Ground, Faridabad. Speaking at a press meet for the event, Yogendra Tripathi, Secretary, Ministry of Tourism and Chairman, Surajkund Mela Authority said, “Tourists today are looking for immersive experiences and the 33rd Surajkund International Crafts Mela provides that very culturally enriching experience for visitors. 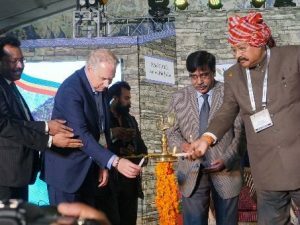 We have craftspersons from all over India with participants from 30 countries.” Other dignitaries present at the event included Vikas Yadav, Managing Director, Haryana Tourism Corporation and Chief Administrator, Surajkund Mela Authority; Vijai Vardhan, Additional Chief Secretary, Department of Tourism, Government of Haryana and Vice Chairman, Surajkund Mela Authority. 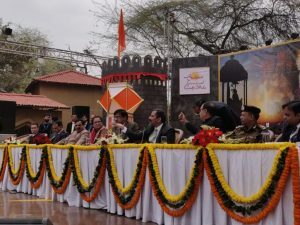 The event is organised by Surajkund Mela Authority and Haryana Tourism in collaboration with Union Ministries of Tourism, Textiles, Culture and External Affairs. Maharashtra has been chosen as Theme State for the 33rd Surajkund International Crafts Mela 2019. A large number of renowned national and international folk artistes and cultural groups will present day performances at open-air theatres located in the Mela premises. The multi-cuisine food court provides ethnic cuisines from all over the world. Minister of State (I/C) for Tourism, K J Alphons recently handed over a Memorandum of Understanding under the ‘Adopt a Heritage’ project to Resbird Technologies for development of a mobile audio guide app for five iconic sites. The five iconic sites for which the mobile Audio Guide App is to be developed are Amer Fort (Rajasthan), Kaziranga (Assam), Colva Beach (Goa), Kumarakom (Kerala) and Mahabodhi Temple (Bihar). During the function, Alphons also handed over the Letters of Intent to seven shortlisted agencies for consideration under the project in the presence of Tourism Secretary, Yogendra Tripathi. These agencies would become ‘Monument Mitras’ through the innovative concept of ‘Vision Bidding’, which will give them the opportunity to associate their CSR activities with a heritage site if the Vision Bid is selected. The ‘Adopt a Heritage: Apni Dharohar, Apni Pehchaan’ project is a collaborative effort between the Ministry of Tourism, Ministry of Culture and Archaeological Survey of India (ASI), and State/UTs Governments. It aims to involve public sector companies, private sector companies and corporate citizens/individuals to take up the responsibility for making our heritage and tourism more sustainable through development, operation and maintenance of world-class tourist infrastructure and amenities at ASI/ State heritage sites and other important tourist sites in India. 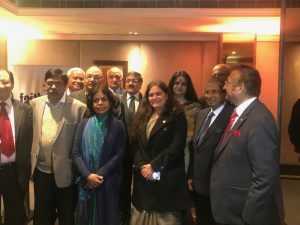 The Federation of Associations in Indian Travel and Hospitality (FAITH) recently organised a farewell dinner for Rashmi Verma, Former Secretary, Ministry of Tourism, at the ITC Maurya, New Delhi. Verma superannuated from her position on November 30, 2018. Thanking her for her contribution to the inbound industry, Subhash Goyal, Secretary General, FAITH, said, “Rashmi Verma has been a great support to the industry in her tenure and has been instrumental in taking many initiatives during her tenure that have proven to be a gamechanger for the industry. The number of Foreign Tourist Arrivals (FTAs) to India crossed the 10 million mark during her tenure. She was a great support for organising the first India Tourism Mart (ITM) in New Delhi recently. She was also a call away for all of us whenever there was an issue plaguing the industry. It has been a pleasure for the industry to work with her and we would like to thank her for being a constant support for all of us.” Also present on the occasion was Yogendra Tripathi, Secretary, Ministry of Tourism, who has succeeded Verma recently. All the presidents and senior members of the associations that are part of FAITH were also present at the event. 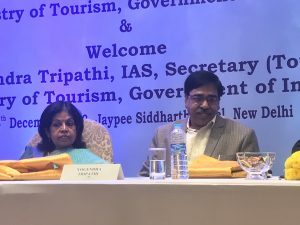 Yogendra Tripathi, the newly-appointed Secretary, Ministry of Tourism, Government of India, marked his presence at the special luncheon organised by Indian Association of Tour Operators (IATO) to bid farewell to Rashmi Verma, Former Secretary, Tourism on her superannuation from the post. Pronab Sarkar, President, IATO, thanked Verma for her support and welcomed Tripathi on behalf of the association. Addressing the members, Tripathi said that he is aware of the contributions of his predecessor for the industry and is hopeful to take the industry voice to the government in the same manner. “There are always unresolved issues, as well as new problems and agendas for the industry. I believe that the Tourism Secretary is nothing but an advocate for the tourism industry. Apart from what we do indirectly, what we do directly is primarily promotional, which is also supporting the industry one way or the other. It is our job to support the industry, and we will continue to do that,” he added.